HINT: When scrapping a vehicle equipped with the SRS or disposing of the horn button assy, be sure to deploy the airbag first in accordance with the procedure described below. If any abnormality occurs with the airbag deployment, contact the SERVICE DEPT. of TOYOTA MOTOR SALES, U.S.A., INC.
Never dispose of a horn button assy that has an undeployed airbag. When deploying the airbag, perform the operation at least 10 m (33 ft) away from the horn button assy. The horn button assy becomes extremely hot when the airbag is deployed, so do not touch it for at least 30 minutes after deployment. Use gloves and safety glasses when handling a horn button assy with a deployed airbag. Do not apply water, etc. to a horn button assy with a deployed airbag. (a) Check the function of the SST. CAUTION: When deploying the airbag, always use the specified SST: SRS Airbag Deployment Tool. Connect the SST to the battery. HINT: Do not connect the yellow connector of the SST which is to be connected with the supplemental restraint system. Check the function of the SST. Press the SST activation switch, and check that the LED of the SST activation switch comes on. CAUTION: If the LED comes on when the activation switch is not being pressed, SST malfunction is possible, so be sure not to use the SST. Disconnect the SST from the battery. (d) Remove the steering column cover LWR. While turning the steering wheel assy to the right and left, remove the 3 screws and steering column cover LWR. CAUTION: Check that there is no looseness in the steering wheel assy and horn button assy. Disconnect the airbag connector (yellow colored one) from the spiral cable sub-assy. Connect the SST connector to the airbag connector of the spiral cable sub-assy. When disposing of the horn button assy, never use the customer's vehicle to deploy the airbag. (a) Check the function of the SST (see step 1-(a)). (b) Remove the horn button assy (see page 60-17 ). When removing the horn button assy, work must be started 90 seconds after the ignition switch is turned to the "LOCK" position and the negative (-) terminal cable is disconnected from the battery. When storing the horn button assy, keep the upper surface of the airbag deployment side facing upward. (c) Using a service-purpose wire harness for the vehicle, tie down the horn button assy to the disc wheel. CAUTION: If the wire harness is too thin or an alternative object is used to tie down the horn button assy, it may be snapped by the shock when the airbag is deployed. This is highly dangerous. Always use a wire harness for vehicle use with an area of at least 1.25 mm2 (0.0019 in.2). Install the 2 bolts with washers into the 2 bolt holes on the horn button assy. After connecting the SST below to each other, connect them to the horn button assy. Using 3 wire harnesses, wind wire harness at least 2 times each around the bolts installed on the left and right sides of the horn button assy. Tightly wind the wire harness around the bolts so that there is no slack. Make sure that the wire harness is tight. If there is slack in wire harness, the horn button assy may become loose due to the shock when the airbag is deployed. This is highly dangerous. Face the upper surface of the horn button assy upward. Separately tie the left and right sides of the horn button assy to the disc wheel through the hub nut holes. Position the SST connector so that it hangs downward through a hub hole in the disc wheel. CAUTION: Make sure that the wire harness is tight. 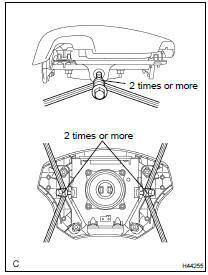 If there is slack in wire harness, the horn button assy may become loose due to the shock when the airbag is deployed. This is highly dangerous. Always tie down the horn button assy with the pad side facing upward. It is highly dangerous if the horn button assy is tied down with the metal surface facing upward as the wire harness will be cut by the shock caused by the airbag deployment and the horn button assy will be thrown into the air. NOTICE: The disc wheel will be marked by the airbag deployment, so use an extra disc wheel. CAUTION: Place the disc wheel on level ground. NOTICE: To avoid damaging the SST connector and wire harness, do not lock the secondary lock of the twin lock. Also, secure some slack for the SST wire harness inside the disc wheel. Move the SST at least 10 m (33 ft) away from the horn button assy tied down to the disc wheel. (e) Cover the horn button assy with a cardboard box or tires. Covering method using a cardboard box: Cover the horn button assy with the cardboard box and place the weights on the cardboard box in 4 places with at least 190 N (19 kg, 43 lb). When the dimension Y of the cardboard box exceeds the diameter of the disc wheel with tire which the horn button assy is tied to, X should be the following size. If a cardboard box which is smaller than the specified size is used, the cardboard box will be broken by the shock from the airbag deployment. Covering method using tires: Place at least 3 tires without disc wheels on top of the tire with disc wheel which the horn button assy is tied to. CAUTION: Do not use tires with disc wheels. The tires may be marked by the airbag deployment, so use an extra tire. Check that no one is within a 10 m (33 ft) radius of the disc wheel which the horn button assy is tied to. (g) Dispose of the horn button assy. Remove the horn button assy from the disc wheel. Place the horn button assy in a plastic bag, tie it tightly and dispose of it as other general parts disposal.